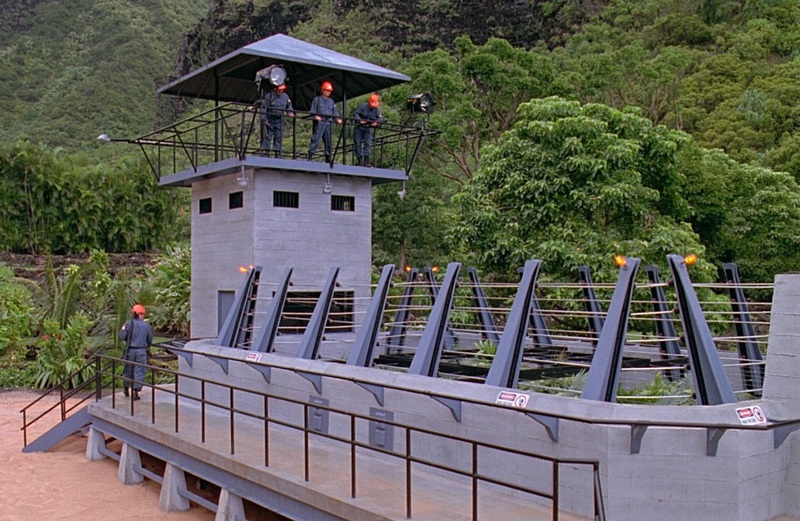 The raptor holding pen was a containment facility for the Velociraptors on Isla Nublar. It was built in 1992, in response to the Raptors systematically attacking their paddock fencing during feeding times. A concrete structure with high voltage fencing at the top in addition to steel bars, the building was designed specifically to hold the Velociraptors. The building has a tower that enables security guards to get a good overview of the pen. Large lights are added to the tower in order to illuminate the cage at night. With a special feeding system live cattle can be transported into the holding pen safely without exposing any personnel to the extremely dangerous Velociraptors. 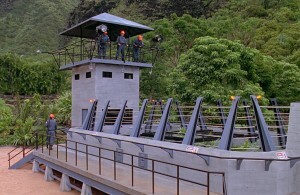 At the time of the Isla Nublar Incident, plans had already been made to build a viewing area into the holding pen, below the platform outside. This viewing area was to have eight-inch tempered glass set in reinforced steel frames, to ensure the security of any people in the viewing area. The pen has a special cage with which animals could be moved into it. This cage was used to transport the Velociraptors into the holding pen. After the raptors are moved into the cage, the cage is moved to the holding pen with a forklift. The cage is then mounted onto a set of tracks, with which it can be slid to the front of the pen. Once it is secured, the doors of the cage and the holding pen can open to allow the raptor to enter the pen. In the official map of Jurassic Park, there is a section designated to Velociraptor. The purpose of the pen was possibly a temporary holding facility. Whether the dinosaurs were taken from the main paddock or stored here before the final move is not made clear. 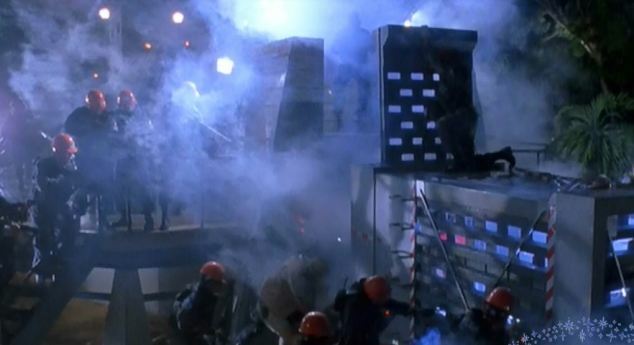 Despite the extreme security measures taken to keep the Velociraptors inside, accidents have taken placed that endangered Jurassic Park workers. When the raptors were first moved into the cage, the cage slid away from the pen and a raptor grabbed the worker. Despite being tazed, the raptor kept trying and eventually succeeded in dragging the worker into the cage and killing him. This incident, amongst others, led to the investors of Jurassic Park being increasingly worried about the security of the island. Furthermore, the raptors have attacked the fences at several occasions to test them for weaknesses. This happened during feeding time, when the top fence was opened temporarily to allow the cattle to be lifted in. After the power shutdown during the Isla Nublar Incident the raptors destroyed the now no longer electrified fences and ran off into the jungle, escaping the holding pen.